Now we will try some Baby Steps with images in Blot. I made a folder in the Blot folder inside Dropbox called Images, except it has an underscore as the first character, before the Images part, _Images. That makes it a public file, according to my limited understanding. Then I plopped an image in there, a 244 X 340 jpg file, and made the usual markdown text for an image, you know, the one that starts with an exclamation mark. But the URL for the image is not the usual path to a place on the Internet. 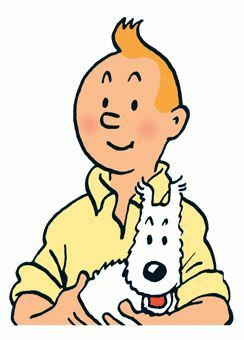 Instead it points to that folder using /_Images/Tintin & Snowy.jpg. I think the geeks call it a relative path. I copied the format from the Blot help file on Formatting blog posts. Look down near the bottom. I saved the file as a draft and the image looked great on the preview of my blog. This experiment took about 30 seconds and worked on the first try. Looks the same, right? But the second version is subject to linkrot. If they move that image, it disappears from my blog. So downloading the file and using the relative path link to my Blot folder with the images is far superior. PLUS all my images will be there in that one folder inside my Dropbox Blot folder. That just feels so simple and elegant to me. Of course you have to make sure the image isn’t restricted by copyright. Having been introduced to this cartoon character, my next impulse was the same as always: look for used books on the subject. Well there are a lot, which is not too surprising, as “The series was one of the most popular European comics of the 20th century,” according to Wikipedia. As you can see, some of them are rather pricey. When I went to college, it was the first time I had been out of my home town on my own for any extended period of time. There was only one other person there from my high school. So that meant there were about 3,000 strangers on the campus, which was to become my new home for four years. I think we had a one week orientation period to get used to our new environment. Then the Internet became the place to meet a lot of new people, from all over. Are we still defined by where we live? Apparently not. Microblog has a Discover page, which links to eighteen users and suggests that a new person follow some of them to get started. Everyone has an About page, or more like an About blurb, because they’re mostly pretty short. This is how people introduce themselves, presumably presenting what they’d like others to know about them, for starters. I looked at all eighteen and found two that gave their geographic location: one in Saint Paul, MN and one in Austin. That’s it. More than 88% made no mention of where they are from. 100% of them gave the URL to their blog or other website, fairly often they listed nothing else in their About blurb. This makes some sense. Microblog was started to provide a new platform for blogging and to encourage blogging. So where are we from? Our blogs. Who are we? Bloggers. For the sixteen who didn’t disclose their geographic location on their Microblog About page, I clicked on the link to their blog or website. On the landing page where I arrived, there was usually a link to another About page. I looked at their landing page and then on their about page. Four of the sixteen gave their geographic location on one or both of those pages, the rest did not. So we’re down to 2/3 of the original eighteen on the Discover page who were still in mystery locations, as far as we could tell. I did not continue the experiment, hunting through their website to find a geographic location. I did happen to notice that with one of them, it would take only one more click to learn their location. Does this all stem from a desire to maintain some privacy? We know we’re being tracked all the time on the Internet. Is this a way of hiding out, just a bit? Maybe we don’t like being pinned down. I usually have Location turned off on my phone and this pisses off Google and some other websites, like Amazon. I get nudged to please turn on my location. Usually I don’t. Or has geographic location become irrelevant? Especially in the US, it seems like every city has all the same name brand stores in all the malls. We can watch the same TV networks in all of them. And so on. Maybe it doesn’t matter where we’re from any more, as every place is same same but different, as they say in Thailand. Like Bob Dylan, I grew up in the Midwest, but I’ve been living in California for the last fifty years, currently in Salinas. Soon we will be moving back to my home town for my eventual retirement. Notice I didn’t say where in the Midwest? Ha ha! @kulturnation It would be interesting to see one of those studies. Should I add a trigger warning at the top of my article? No worries, no offense taken! I can imagine that the Q could be offensive, if asked with no real interest in the answer, or as a put down. @Ron The studies were made in Germany. One problem is that (here) it is mostly asked to people with migration background (or having a “foreign” name or just looking like foreigners). These people then are put in boxes, and it’s not a conversation that starts but something like a script. @Ron (2/3) and 15 min later the people have flushed Mr Olsson with all their “knowledge” of Sweden, but don’t know anything about him. Or when it runs a slight different plot line, they know everything about him and his family and haven’t talked about themselves for a minute. @Ron (3/3) This is the experience of many people in the studies. They feel objectified with very negative consequences; and so many would prefer to be asked what they are doing. Or even given the chance to ask. @kulturnation Hmmmmm. Like when folks sit around chatting, but no one is listening, everyone just waiting for their turn to talk? A willingness to listen/understand is a prerequisite for real live communication. Maybe “What kind of work do you do?” would be a good ice breaker. I’m active on the new Microblog site that Manton Reese has created. (See my link in the header above.) I guess it’s still in beta, because it’s not yet open to everyone and he’s constantly adding new features and fixing things. It is generally designed as a micro blogging (short posts) site that isn’t a silo. I signed up for the Kickstarter because I wanted to try out a new blogging platform that isn’t a silo, sort of a Twitter that is more a part of the IndieWeb. So far I’ve been enjoying it a lot! The time I used to spend on Twitter, I’m now spending doing blogging on Microblog and here on Blot. I paid money in the Kickstarter to be able to have my Ron.micro.blog site hosted on Manton’s server. Then I splurged ($20/year) to also have this blog on Blot. On top of that, I went crazy with a spending spree at Namecheap and bought my own domain name for every subject I have posted about in the past and/or that I expect to write about in the future. A LOT of them. To me, it seemed like the bare minimum for having some independent presence on the Internet is to publish on a site(s) where I own the domain name. The only reason I did this is that at long last I have a computer guy who I pay to setup servers for me. I would never try to do it on my own, as I’m a tax accountant. not a web designer, sys admin or computer engineer. But many of the folks on Microblog are one of those things that I’m not, most of them being of the Apple computer persuasion. One of the main things I see them tinkering with is Webmentions. They all have their own websites or blogs and Webmentions seems to be a key element of going the full IndieWeb route. So they’re working on getting their websites working with Webmentions and also getting all that to work with Microblog. This all goes over my head. By taking Baby Steps, I was able to get this Blot blog working. But remember, I’m a tax accountant, a good one with over thirty decades of experience, not a computer nerd. Many of these developers, who mostly use Apple tools, have been super nice to me, even though tax accounting means I have been using Windows computers for about forty years. They don’t hold it against me, at least not out loud. I’ve had more interaction with these folks than I ever did in five years on Twitter and ALL of it has been friendly, positive and helpful. Is Webmentions the Next Fork in the Road I Must Take? Baby Steps can only get you so far, especially if you’ve decided not to go the silo route any longer. Do I need to get Webmentions working? I’ve been kicking this around in my mind, reading about various things these developers are doing to make it work for them. It always sounds pretty darn complicated to me, with its own special jargon and I’ve been lazy about getting all these new terms defined. It’s hard to sing the tune, if you don’t know or understand the words. Yesterday Jeremy Cherfas wrote a short piece, We are still a long way from home that made a lot of sense to me. Maybe silos are popular because they’re so damn easy to use! I found the link to Jeremy’s posting on the Microblog Home stream yesterday morning. But when I went back later to look at it again, it seemed to have disappeared from the Home stream. Fortunately I had clicked Favorite on it, so I was able to find it again and follow it to his blog. Once there, I poked around and found a much more detailed discussion of Webmentions. I looked at his About page and found he’s a freelance communicator, probably an expert one. He doesn’t seem to be a web developer, but wanted to get this Webmentions thing working on his website. His article describes the many hours he has spent trying to get it working using a plugin he found and then another approach he is taking. He is obviously very motivated to getting this stuff working, which is clear from the title he chose for his article, Not giving up on IndieWeb. He also linked to an article by Glenn Dixon, who HAS given up on IndieWeb and webmentions in particular. He makes a sobering statement about all this: There is a reason that the handful of people who actually care and talk about this stuff have careers in programming. At this point, that is what is required to get this up and running. I had been suspecting that this technology was not ready for my Baby Steps approach. My suspicions seem to be well founded. Jeremy Cherfas is likely well beyond the Baby Steps stage and persistent as hell on top of that. Last night I visited Jeremy’s first short article again and discovered that it had acquired a comment at the bottom from Chris Aldrich, who said there is a “(currently small) group of geeky IndieWeb users who will eventually make it easy enough for everyone else too.” Hey, maybe this is even a webmention in the flesh, but one that confirms that the stuff is not yet ready for my Baby Steps! So I decided not to take the Webmentions fork in the road, at least for now. I have only one reservation about the development of this IndieWeb stuff. While it is in progress, most of these websites have disabled regular comments, if they ever had them. Often there is also no contact information given, or it takes a lot of hunting on their websites to find it. So if one doesn’t have webmentions working on one’s own website, there is no obvious way of communicating with these folks about things they post. I have found that if they’re also on the Microblog website, one can post a message there, addressed to them. But that seems pretty round about, when an old school place to post a comment on their original post would be very easy to leave. I guess that’s a temporary cost of progress during this interim period. What is the next step I can take with my Baby Steps? Well maybe I will see whether I can get a picture posted on this blog, maybe even a picture with some text along with it. That might be nice. Colin Devroe wrote an article pointing to this one, which I then replied to on his blog. He replied to that and that comment appeared as a webmention on Jack Baty’s blog. And I began to see why people might want an automated way to keep track of all this stuff! I find it very interesting that Colin decided to turn comments back on, on his blog, after reading my article. Definition from Google: blogroll noun - (on a blog) a list of hyperlinks to other blogs or websites. On Blot, it would be possible to make such a list, but it would need to be a Page, linked to from the menu at the top of the blog, so that it would be one click away at all times. But for a personal blog, is that really needed? Here, I consider that I’m free to write about anything at all that catches my eye, or triggers something in my mind. If I were limited to a particular subject here, it would make sense to provide links to other resources and/or blogs on that subject. But here, the subject could be almost anything. So what to do? For now, I’ve decided not to create one. But what about rivers? I will certainly be creating some of those for various categories of information, in the areas that interest me the most, or which I want to bring to the attention of others. I think it would make sense to link to those rivers from my personal blog, as my interests are certainly something that make me unique as a person. And maybe that is a more modern equivalent of a blogroll. Each river is comprised of streams from selected websites or blogs, those that I select, just like a blogroll. But rather than a link to a static destination, a link to a river points to a live flow of articles, always updating in real time. The reader can immediately see samples of the content in each stream, with an option to click on any given article to read it in full. Isn’t that what a blogroll makes possible too? A River is like a live blogroll on steroids. Today there has been a discussion on Microblog about discovering people to follow on the site. Reading the thread got me to thinking about what I have done while using the platform. In the beginning it was evident to me that it was gonna be a very quiet place unless I started following people, so their postings would appear in my Home stream. So I clicked on the Discover tab and saw the list of users given there. There were only a very few names that I recognized, such as Leo Laporte and Brent Simmons. How was I to decide who to follow?? I decided that, at least in the beginning, I didn’t care what any of these people were gonna post about. I just wanted to be able to read some posts. So I followed everyone on the Discover list. Now as it turned out, some of these folks very rarely posted anything on Microblog. But some did and that gave me something to read. Then some of them would reply to users who were not on the Discover list, so a second strategy evolved. Any time a new name would come up in one of these replies, I would follow the new name. That has given me plenty of people to have a decent amount of activity on the Home stream. All along I figured I could always unfollow people, if I found there was too much activity for me, or there were some with really obnoxious posts, but that has not happened. I’ve never unfollowed anyone and just keep following new people when they appear. I used a third strategy for a while. At the bottom of the Discover page there are images, with the user names of the people who posted them. I looked for names I didn’t recognize, clicked on those names, and if I wasn’t already following them, I would immediately follow them. I haven’t done that for a while, I suppose because I’m getting plenty of activity in my Home stream. There is a fourth strategy, which I have not yet tried. One active user on Microblog has posted the user names of folks on his own blog who have responded to his postings. I could check this listing for any I don’t yet follow and then follow them. But I have not yet done that. Microblog has become an important micro-blogging platform for me. I post directly on the site with my Chrome browser, not as a cross-posting from anywhere else. I have no particular ulterior motive with this. I just wanted to try out a new platform that is independent of the silos. I’ve tried to post things that might be of interest to others, to elevate the mood and inspire, when possible. Mainly I am interested in what I might find on the site. Twitter discourages my Microblog strategy of following everyone, because there is a limit to how many folks you can follow there, in comparison to how many people follow you. So I have always tried to keep those two scores fairly balanced. I’ve noticed many Twitter users game this regularly. They will come along and follow me. If I don’t follow them back fairly promptly, they will unfollow me. Clearly they have no real interest in anything I might post. They just want to beef up their following scores. I’m just someone who might help their scores. It’s fine with me if they go away. There are no visible scores on Microblog. This is a very good thing. It means I can just concentrate on posting things others might find interesting and then being interested in things I might find posted by others. There’s no way to tell who’s popular, nor a way to game a system to look more popular. I hope that doesn’t change. Des Paroz was the first to comment upon this article, by posting one of his own on his blog, which made for a red letter day for me, especially when he used the words real gold in his comments! Then Colin Walker also wrote some very kind words about my article. Unfortunately I can’t find those right now. I think they might have been posted on Microblog, rather than his own blog and there is no search function to find things on Microblog. This is all so new to me that it did not occur to me to update my article with these comments, before it was too late to find them. Then Jack Baty posted his own ideas about this subject on his own blog and then blew my mind with several comments made on Microblog appearing at the bottom of his posting, capped off with a webmention from Colin Devroe, who had replied to a comment I had posted on an article he did about my article on Webmentions. Are you following all of this?? I’m compiling RSS feeds to be used in a new River 5 installation. This is basically a live interface for an RSS reader. There are already other Rivers on the web and there’s no point in my duplicating them. So I have compiled links to the other Rivers I know about below. Once my own Rivers are configured, I will announce them here. Click on the above links for the latest on the above categories or from the above sources.